"Inundated" scarcely describes the response from readers, who have written, e-mailed and phoned in large numbers on learning of the imminent demise of "Milltown Memories." Your many kind comments are greatly appreciated and the extent to which the magazine will be missed has taken us all by surprise. It's extremely gratifying and heart-warming that the magazine has earned such a special place in your affections. 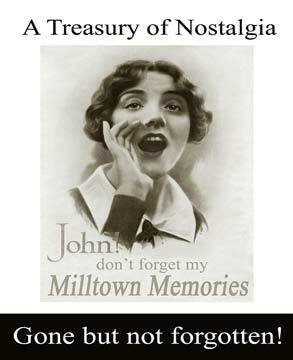 As I explained in our penultimate issue, "Milltown Memories" will continue as publishers, now part of the Pennine Heritage organisation to which the Alice Longstaff Gallery Collection has been gifted. This move is just the first step in exciting, new developments for the collection, in which its future is assured. It has always been custodian Frank Woolrych's intention that Alice's remarkable legacy should belong to the people of the town and district she served all her life, and this important initiative is the first in the long-term aim to make the collection an integral part of local heritage. Next year (2007) marks the centenary of Alice's birth, so the new departure could not be more appropriate. It is with some sadness, I must admit, that I sign off as "Milltown Memories" editor but as someone once said - the future's looking bright!